The Guardian is about to make major cuts to its U.S. operation, reducing staff by 30%, leaders there announced in a meeting Thursday. Roughly 50 jobs will disappear out of about 150 across editorial, commercial, and administration, according to a source inside the meeting. The cuts, which were first reported by Politico, will be accomplished through a combination of buyouts and layoffs. The announcement led to a tense Q&A session with staff and management, as employees pressed management on how quickly the organization had gone from expansion to contraction. "Lots of unhappy faces," the source inside the meeting told CNN in an email. "Lots of people concerned at being in the job market in December/January." The Guardian had until recently been aggressively expanding its operations across the globe in search of a worldwide audience to compensate for the worsening fortunes of U.K. newspapers. The U.S. branch, which was launched in 2011 -- its fifth anniversary was on Wednesday, one day before the announcement -- had arguably been the crown jewel of that expansion. In 2014 it won a Pulitzer for its work breaking Edward Snowden's leaks about NSA surveillance. That success, and the audience growth that came with it, never brought the revenue that executives had hoped for, however, and the paper as a whole has been tightening its belt as a result. Its U.K. base was hit with significant cuts earlier this year, but until now the U.S. had been spared those kinds of austerity measures. In a statement, The Guardian said that it remained "committed to Guardian US and to building on the remarkable success of our journalism" but that in order to break even these cuts were required. "We said in January that we want Guardian Media Group to break even at an operating level within the next three years and that no part of the business can be immune from tough action to secure the Guardian in perpetuity," a Guardian News & Media spokesperson said in a statement. In an email to the paper's worldwide staff obtained by CNN, David Pemsel, CEO of Guardian Media Group, and Kath Viner, the Guardian's editor in chief, noted that their website has seen strong U.S. audience growth in the first quarter of this year and that it was "now among the top five digital newspaper platforms in America." However, they added that digital advertising revenues are being eaten up by companies like Facebook. "US news publishers are facing conditions as challenging as those of the UK," Pemsel and Viner wrote. "[C]ompanies such as Facebook and Google are growing in dominance -- by some estimates, 85c in every new dollar of digital advertising revenues is going straight to them. 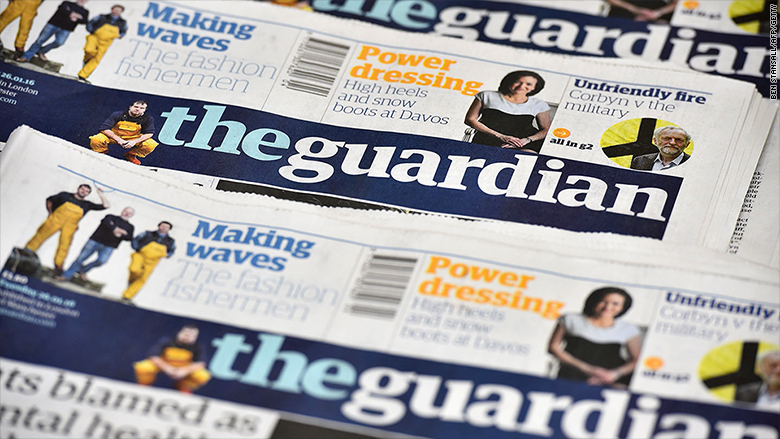 It is inevitable that such seismic shifts in the business model are adversely impacting our revenues despite the Guardian's strong US brand recognition." Pemsel and Viner confirmed in their email that the Guardian's U.S. staff will be reduced "to approximately 100 people" and wrote, "The impact will be spread across all departments and the priority is to protect Guardian journalism. We will maintain streamlined newsrooms in New York, Washington DC and San Francisco... Other savings will come from freezing recruitment and reducing spend in areas such as marketing, consultancy, travel and general expenses." The union that represents journalists at Guardian U.S. responded to news of cuts by saying in a statement it was "deeply disappointed to learn of the company's decision, considering the optimistic financial projections made to us within the last year." "However, management has committed to working with the union to decide how cuts will be made," the statement said. "We are committed to fighting for fair and equitable treatment for the entire Guardian US editorial staff for as long as it takes."